Parsing how the past is used online and in video games. Guest post from Robert Houghton. Robert mainly researches urban and episcopal history in Italy in the eleventh and twelfth centuries, and also has a strong interest in the portrayal of the Middle Ages in the media. He currently works at the University of St Andrews and as a research consultant for Paradox Interactive. Note: This article was originally unintentionally truncated due to a track-changes error. Below is the full Director’s Cut. Some weeks, especially when I’m teaching, I don’t so much as glance at Facebook, but out here in ResearchLeaveLand, Facebook becomes a seductive distraction from actually getting work done. However, I’ve started to think it’s having a more interesting, and profound, effect on my scholarship than that. In academia, personal and professional identities tend to be closely intertwined, and Facebook now seems to be their social network of choice. LinkedIn has never taken off among my academic friends, nor have the discussion pages of Academia.edu taken off. I’d rather be using a non-evil, open-source alternative like Diaspora or Friendica, but for now, if you want to make friends with a medievalist, Facebook is probably where you go. Medievalists aren’t that used to thinking about their research as an extension of their personal politics. Despite some noble exceptions, medievalists have a heritage of ignoring critical theory and seldom explicitly address politics in their research or teaching (and when they do, it’s mostly feminism, which is fine, but hardly everything). * But I have an anecdotal sense that Facebook is having a role in politicising medievalists’ academic identities in ways we never expected when we signed up to it—or to studying the medieval past. Obviously there’s loads of proper research on the social consequences of Facebook—on how far it promotes enlightenment, or freedom, or joy, or groupthink, or oppression, or envy—which I won’t attempt to touch on here. And maybe my experience of Facebook is unusual. But I guess some things about putting a bunch of academics on Facebook are almost inevitable: you can get instant, expert help with research problems; you can ask if anyone can send you that article in Another Journal Too Expensive for My Library to Subscribe to Studies. You agonise about whether to befriend your students before graduation day; you get distracted from your research. But more surprisingly, yet more profoundly: Facebook means that I know a lot more about my colleagues than I used to. I don’t particularly mean the people in my department, who I know by their words and deeds from day to day—in three dimensions, as it were. I mean my colleagues out there in the Republic of Letters: the people ‘in my field’, whether lecturers, postgrads, or the amateurs who get the starring role in Carolyn Dinshaw’s How Soon is Now?. Before Facebook, I mostly knew these folks only from the articles and books they published, or from bumping into them now and again at conferences or in the British Library. If you’re having a chat with someone at a conference, you’re probably going to talk about your research or last year’s teaching load. Should you somehow discover that one of you thinks that meat is murder while the other’s reaching for a ham sandwich, a mutual desire for self-preservation will probably kick in and before you know it you’ll be discussing cutbacks in research funding. You can co-write an article with someone and never have the slightest idea of their views on gay marriage, global warming, unionisation, or electoral reform. A couple of years of Facebook acquaintance pretty inevitably changes that—even if it’s just that you start to notice what gets people clicking the ‘like’ button. You could never say that Facebook gives you a three-dimensional sense of someone; but a shift from a one-dimensional acquaintance to a two-dimensional one is still quite a big change. I’ll give a straightforward example of how getting to know people on Facebook affected my work: it’s helped me recognise how the conservative politics which brought me to academic medieval studies back in my teens still in some ways shape my research. But then I want to think about some more subtle effects that Facebook may be having on medievalists’ academic identities: changing how well we know each other’s politics changes how we work more generally. 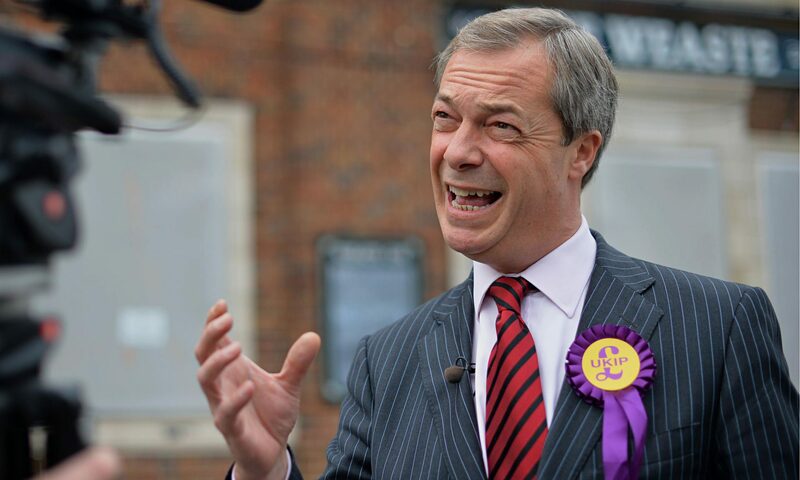 Nigel Farange: An Elf or a Troll? A year or so after I joined Facebook, I started getting friend requests from people I’d never met or had met fleetingly at some conference. These people weren’t professional academics, but had nonetheless read and even enjoyed my intractable monograph on early medieval traditional beliefs. Okay, I mean on elves. These folk are often thoughtful and serious neo-pagans or historical re-enactors and I’m honoured that they wanted to get to know me. At the same time, some of these folks who I’ve got to e-know also turn out, among all the common ground, to have some political commitments I’m really uncomfortable with: mostly nationalism, with a politics that in my view at best abets racism or bigotry and at worst simply is racist. (BTW, if this is my view of your Facebook feed, I will have told you!) I’m not saying all the neo-pagans or historical re-enactors I know have these views, but there’s a trend; in England, a key attraction of the Anglo-Saxon or Viking past is presumably that it can be imagined to underpin a white, often patriarchal, English identity. Were it not for Facebook, I would have no idea about this—or little enough that I could ignore it. I don’t think my scholarship is bad, nor that it’s my right to control what people make of it. And English people who are attracted to nationalisms which embrace martial masculinity or oppose Britain’s cultural diversity are generally themselves reacting to oppressions—things like thirty years of growing inequality—or to the cynical, self-interested, divide-and-conquer demagoguery of the likes of Nigel Farrage or Paul Dacre. But their opinions still push me to reflect on the reasons why I, as a white, male teenager in the Tory-voting Home Counties who was looking to find an identity to one side of the mainstream, got into medieval studies myself—and I certainly shouldn’t be so surprised that I’ve wound up asking research questions that appeal to white English masculine identities. This doesn’t mean I should turn from scholarship to writing op-eds with footnotes. But in becoming aware of how my research has previously been constrained by one politics, I have the chance to develop research which questions and challenges those constraints. I’m a long way from working out quite what that means, ut my decision to research the use and abuse of medieval and folkloric ideas in Iceland after the 2008 financial crisis has partly been a deliberate step towards rethinking the cultural frameworks that have defined my scholarly career so far. Facebook had a direct role in changing my research agenda. You’d have to have buried your head pretty deep in the Leopold von Ranke back catalogue to have missed postmodernism entirely; we all know the culture(s) in which we live shape our work, and that the closest we may come to objectivity may be to try to be self-aware and to make our assumptions explicit. Even Peter Burke’s appealing dictum, that historians should take ‘an approach to the past which asks present-minded questions but refuses to give present-minded answers’ might be on the optimistic side. But we are seldom open about political alignments or implications in our scholarly writing. The fact that Chris Wickham is a Real-Life Marxist is occasionally mentioned in the same tone that you might whisper that one of your friends works for MI5; but at least in my corner of the world, it generally still feels a bit declassé for medievalists to have open political commitments in their scholarship, as Kathryn Maude’s recent piece on this emphasises. But the better we know each other, the more we can see that we’re inside politics, which makes me wonder whether, as we start to get used to seeing our colleagues as political animals, we’ll become more accepting of politics as part of our own academic personas. My impression is that through Facebook, dispersed networks of scholars are unwittingly building networks of trust (and also distrust), enabling them to talk to people in their field (sometimes online, sometimes in person) about problems like bullying by their employers or sexual harassment. You’d be fairly unlikely to be open about this if all you knew about someone was that they were an expert in, say, ninth-century Sicilian fortification. These networks are more likely to lead to real-life action within academia. One little example is that my rage at seeing some academics saying on Facebook that they’ve vandalised Wikipedia inspired me to a blogpost about Wikipedia’s merits that seems, in turn, to have changed some of my colleagues’ views. Rightly or wrongly, I think of Facebook as our (more socially inclusive) version of the eighteenth-century European coffee-houses which were the nodal points in modernity’s new ‘public sphere’ as Jürgen Habermas imagined it in his The Structural Transformation of the Public Sphere. Probably 95% of the time, those eighteenth-century coffee-guzzlers were just off their heads on caffeine, laughing at the eighteenth-century equivalent of each other’s compromising selfies. But the other 5%, they were reading newspapers to each other, arguing about them, and, however improbably, forging a new politics. They even had a part in Europe’s yet more improbable shift from monarchy to what we call democracy. Right now, I’d be willing to settle for a bit more support for the free-access publishing: for carrying through the so-called ‘academic spring’. But change is afoot in medieval studies. And I like it. * Not that engaging with critical theory is everything: I know some people in other fields whose research and teaching seems profoundly politicised but whose real-life commitment to these politics turns out to be about as stout as a jellyfish.